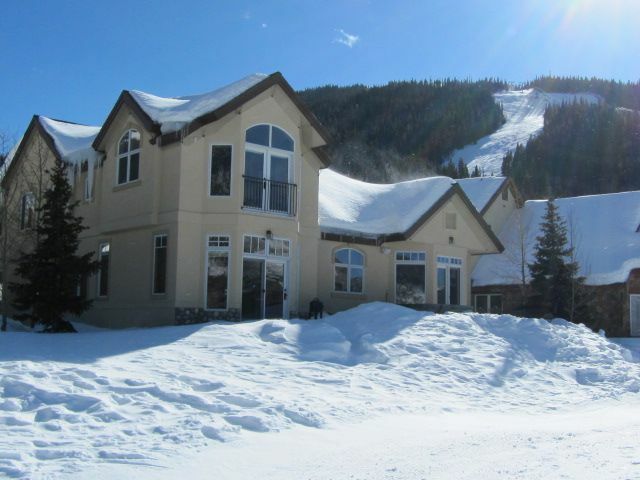 Ski InLuxurious, beautiful 4000 square foot house SKI IN to Super Bee Lift. Home includes large great room with fireplace and sound system and hot tub on patio. Perfect for entertaining and relaxing after a day of skiing! Home has two romantic king Master Suites each with fireplaces and French doors to patio or balcony. Three additional bedrooms -1with a king bed and 2 queen-size beds and trundle beds beneath allow for flexibility. Great for the kids! This house also features an upstairs studio 'apartment,' complete with kitchenette, bar, TV/VCR, couch(queen sleeper sofa), bunkbeds, fireplace, and game table. House includes an over-sized mud room complete with cubbies for ski accessories, as well as washer and dryer. This house is perfect for multi-family vacations or business retreats!